And one more taste on Stuck On You before this fabulous week is up. When she slowly blinked at him, he glanced around the bar to see if the audience for his coming set down was as large as the night before. There were only two other tables filled so no. That was a good thing. Privately, KT was sure she needed a little bit more than that but he’d managed to escape a near-death experience and had gotten things back on track. She did a strangled snorting laugh and he felt the flutter in the pit of his stomach. It was pleasure. He got the feeling she didn’t laugh like that often. The fact that it embarrassed her was his first clue. It was damn cute. The light flush on her face spread down to her chest and he started to feel a little hot under the collar too. Let’s meet Misty! (She’s been a blog stop, but here’s a little fact you did not know…just between us…the first time I saw the cover, the doggy model was very clearly not a girl. Photoshop works wonders!) Misty’s pretty important at the hotel, especially in the next book. “Yeah, that part I remember.” Her lips twitched as she met his stare. “Oh, what I meant was, yes, sir. Of course, sir. Excellent choice, Mr. Masters.” She turned to walk down to the window to turn in the order. He watched her efficiently fill a glass and wondered how many places in the world he could get a drink made by the world’s shortest and most sarcastic showgirl. She had a smart mouth. He wanted to kiss it. When she quickly, and it looked like subconsciously, shifted the halter to bring the low neck up and then tugged on her skirt to bring it down, he decided she probably hadn’t dreamed of a life in the showgirl spotlight. She looked a little bit like a teacher. As always, when he met new people, he had an entire backstory created before he really had a name memorized, and he was intrigued by her story. He glanced around the nearly empty bar again but just as he heard her plop the glass down on the bar in front of him, he saw a dog in the doorway. He was long and lean, with tan fur and dark markings around his droopy eyes. Two long, floppy dark brown ears seemed to be melting from his head. He sat perfectly still, like he was waiting for the hostess to seat him at the next available table. He turned to Laura. “I’m not hallucinating, right? You see that ugly dog in the doorway too?” He pulled out his phone, snapped a picture, and tweeted it with the caption: Please wait to be seated. KT tilted his head as he looked at Laura and tried to guess whether or not she was serious. The look on her face said she meant every word and, even better, knew how ridiculous it sounded, but he knew telling tall tales to outsiders was a Southern tradition. He didn’t know whether to hope it was all true or just a way to pull his leg. He heard a whistle and Misty the bloodhound trotted off before he could make up his mind about the chances of the little green bows being real. Who doesn’t love books? I don’t even know. Because I feel like celebrating, let’s do a little giveaway. I’m such a beginnery type, but I’m thinking I need to restrict it here to the US. In the comments, let me know your favorite Elvis tune! I’ll change the question tomorrow so enter again! On Saturday, I’ll draw winners. 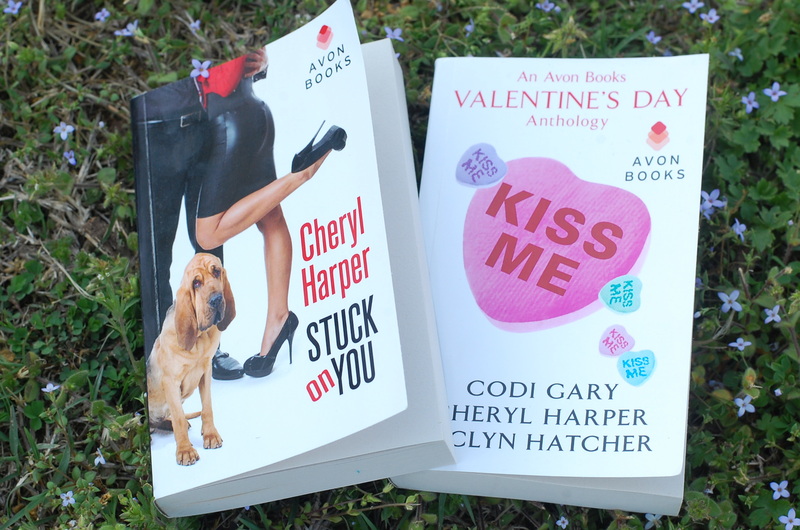 At the least, I’m giving away signed copies of both Kiss Me and Stuck on You. Depending on the number of comments I get (and how many I copies I have), I may send more. Make sure I have some way to contact you! Starting next Monday, I’ve got stops, people. There will be chances to win there, too. AND I’m over at The Book Tart. This interview is epic, y’all. My anthology sister Codi Gary’s giving away a copy at her blog: CLICK CLICK CLICK! AND this is gonna be fun: On Wednesday, Avon’s hosting a Post a pic of your pet event on their Facebook page. Put up a picture of your pet with any Avon book for your chance to win a copy of STUCK ON YOU!